Readers Are Leaders! Reading is a great way for you to grow and I love sharing new books to help you flourish! Employees have less loyalty to their employers and most seek more than just a paycheck. They want a positive culture, strong teams, recognition, and opportunities to learn and to contribute. Sadly, a majority of employers don’t share the same goals and are hyper-focused on numbers and results, not engagement. I have worked for a few companies that lack a strong or caring culture. They are all talk, and it shows up in employee engagement scores and overall company performance. One of my previous employers has recently fallen prey to lower sales and production. They took their eyes off of their employees and neglected to engage them, recognize their efforts, and apparently didn’t care about people or even work-life balance. Moreover, employee engagement was non-existent, and now the company is suffering. Some of my experiences with prior employers were a stark reminder of the pitfalls of poor culture and low engagement. When I read Mark Miller’s new book, Win the Heart – How to Create a Culture of Full Engagement it hit home. Mark is very passionate about employee engagement and adamant that culture is the key to employee engagement and productivity. Engagement requires a certain level of care which is reflected in both overall attitudes and actions. As leaders, we should take ownership and be proactive in creating an environment where our people will thrive, and success follows. The CARE Model is an active process to guide us on our journey. I enjoyed Mark’s relaxed and relatable style of writing. I read Win the Heart in one setting not only because culture is one of my passions, but he shares ideas and strategies through storytelling. I quickly fell into the story and felt like I was on the journey with the characters. Each chapter had me cheering them on, and I was engulfed in their struggles and wins. Our story starts with our main character, Blake, the leader of a successful company. His team felt that everything was flowing smoothly until Blake slowly realized that everyone was just showing up to work and going through the motions every day. He started doing some digging and found out that indeed the culture was sluggish and employees weren’t heavily engaged. Blake's team began a courageous journey to travel the world to see what other companies were doing to engage employees and change the culture. Every company he met with had unique struggles and found ways to facilitate change. Our journey with Blake opens up our minds to new ideas, solutions for engagement, and how to win back the heart of employees. We learn that employees are extremely vested in wanting to love where they work and strive to care what they do every day. Blake’s team meanders through their journey walking into obstacles and challenges; however, it is so engaging to see how they handle the process and continue on because of the intense passion that they have for their people and the company. They have a strong commitment to winning the hearts of their people and placing them first because they know it will be an emotional and financial success. Mark does an incredible job of writing this tale to bring the reader into the story for the entire book. I felt like I was a part of the team and was learning without even realizing it. I was thoroughly engrossed in learning about the perspectives of each character on Blake’s team and intrigued how they were able to bring their various ideas and differing views to work together for success – not always an easy feat. Pick up Mark’s book today and jump into his story. You will go on intriguing adventure learning along the way, and I guarantee that your head will be swimming with new thoughts, ideas, and obstacles. You WILL win over the hearts of your people. I am a voracious reader and always looking to learn new ideas and approaches, and then I try to apply them to my personal growth. I enjoy books that aren’t overwhelming with affluent scientific gibberish because I want to be one with the book, not be overcome by statistics and theories that I won’t use on a daily basis. 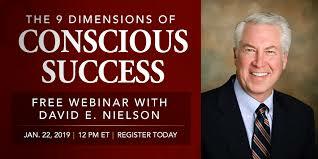 The new book The 9 Dimensions of Conscious Success – It’s All About YOU by David E. Nielson is my kind of read. I was immensely drawn into the book and took notes on how I can personally grow, differentiate myself from others, and live my purpose. David’s writing style is personable, interacting, and full of real-life stories and examples that I can relate to. The book takes us on a journey to be present, be noticed without being flashy, and how to experience personal success. One of the keys to the book is his framework for Conscious Success. Moreover, the Conscious Competence model is a continuum that explains how most people learn and how we can become more aware of how others learn and implement knowledge. David was curious about what drove people whom he deemed successful about what they felt are the elements of a successful leader to help us grow and develop healthy habits. His informal survey asked five key questions, and he compiled the results. In the end, he didn’t throw out any of the factors because they are all critical. The categories ranged from purpose, knowledge, self-awareness, and social awareness – 12 elements in all. All or any of these factors are critical to success, and because we are so individual, we will dwell on some factors more than others. In short, there is no magic bullet, we are all unique, and each piece is critical. It’s like putting a puzzle together – but it’s our own puzzle. Throughout his experiences and research David developed a Conscious Success Model. These elements are the solid foundation for defining your success. He also identified six differentiators which together make up the 9 Dimensions of success. If you notice, Purpose is a crucial foundation for your success. When you know it – share it when you are comfortable doing so. From there, set annual and long-range goals, consider personal development plans, and most of all LIVE YOUR PURPOSE. 2. Proper Placement – How are you placing yourself in the market? Will the job that you have now position you for the future? Do you have the right skills? 3. Active Promoting – Are you putting yourself out there networking and meeting new people? Building your centers of influence? 4. Profit/Value – Know your value to yourself, others, and your company. What are your skills worth? 5. Perceived Gain – What will people gain by working with you? It’s not always about you but what you can offer as well. The 9 Dimensions of Conscious Success is an outstanding book to not only develop your skills and growth, but it will help articulate how you come across and sell yourself to others. I finished this book in one sitting because I lost myself in the ideas and possibilities. David E. Nielson offers real-life examples and how implementing his models will have an impact on your life. There are action steps and lessons throughout the book. The book is down to earth filled with humor and the many mistakes that David and others have made during their leadership and life purpose journey. This book is a winner, and it should be one that you pick up today to start your journey!